Do you have a website for your business? If not, I want you to ask yourself why? Whenever I pose this question to creatives, mainly those who are selling a service/product the first answer is always cost. Is having a website cheap? No, not really; but are there any tools that you need to bring your business to the next level cheap? Seriously, you want to be a photographer you either are using a $900 iPhone or a camera that cost a grand or so. If you’re a fashion designer you may own a very expensive power sewing machine. And if you’re a digital designer of any sort, you know Adobe Programs cost a year’s tuition lol. I look at website as tool that you need to run your business just like equipment or software. Now I’m not disregarding the amount of time it takes to put one to together or the cost to build one up to your liking, but I’m saying it’s all worth it. A website isn’t a one and done thing. You’ll continue to change it over the years. You’ll add some features that may cost more or take away some you don’t need anymore. All and all, I know it’ll be worth it. Here’s 5 ways a website has helped me as a full time creative and could help you too. This blog you’re reading right now is on my website. You get to see my personality in a way that social media platforms like Instagram or Pinterest just can’t do. I have an “About Me” section telling how I started this path of being a creative along with my blog that dives into personal experiences. Yes a picture is great, but we know pictures can be deceiving. Talking to my supporters is what brings us close and makes my artwork more relatable which turns into a sale! I don’t know about you but I don’t use my phone all day everyday. I unplug a lot and delete social media apps every few days. Being on Instagram / Twitter all day, everyday trying to answer DMs, keep track of who’s ordering what through a DM and trying to provide customer service is unnecessary stress. I like making money in my sleep. What that means is, those who want to purchase from me or sign up for a service doesn’t have to wait until I answer their DM. From my experience, a lot of people love shopping in the wee hours of the night. I think my supporters appreciate being able to place a notebook order at 4am without having to wake me. Search Engine Optimization. In simple form, website is a marketing tool that allows you to reach a large group of people. Using keywords in my website, blog, about me and product descriptions allow them to show up in google searches easier. This means that even though I can get a supporter from following my social media, I can also get support from someone searching ‘black girl stationery artist’. Even though I haven’t build this up so much on my current website, through Etsy is was probably the fastest way to find my shop. I’m a numbers person when it comes to business. I like to see how many visits I had from week to week. I want to see what search term people are searching on my website and from what social media links I’m getting the most hits. With my website, I’m able to get all the analytics needed to help improve my marketing skills. I also get to see cool things like what country people are from who’s visiting my shop and how many links they’ve clicked. Kinda like the 24/hrs thing, having a website is a formal way to have around the clock surveillance of how my supporters are interacting with my products. Having a website has really put me ahead with my supporters trusting me. They know that they’re purchasing product through a secure system and if need be disputed, it’s a formal process that’s fair. My professional and organized feel of my website allows for my supporters to enjoy the experience of shopping. Also, for a company point of view, they can see that I’m well put together. This is has been a turn on with me being able to work with so many other businesses and I appreciate it. I had a conversation with a random group of consumers and they said they’ve seen great artwork, clothing, bath products and such on Instagram and didn’t purchase because there wasn’t a website. Having that website was the determining factor of if they could really trust the small business and that says a lot. 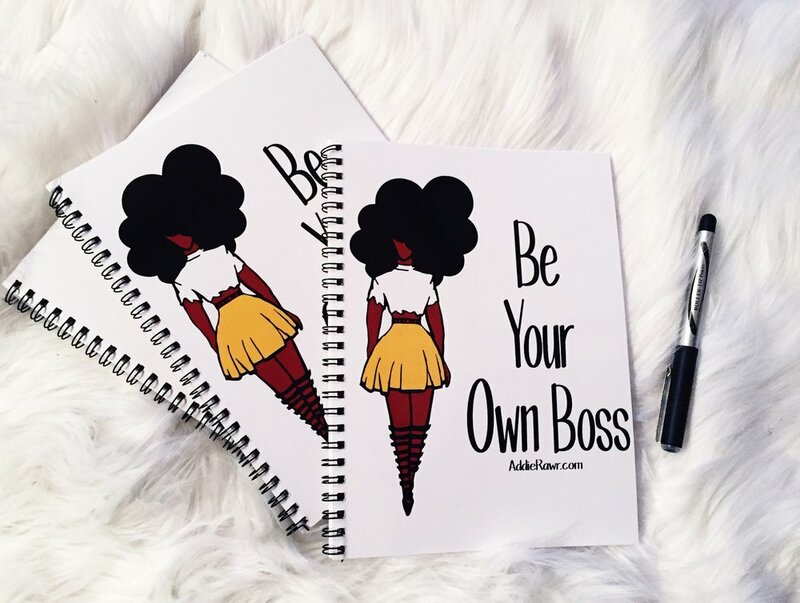 Be Your Own Boss and get control of your business .. shop notebooks here! Now if you’re still feeling like you don’t need a website, I get it. I can’t say that you will not be successful because you don’t have one and I can’t say that people will not purchase. I will say that having one put so much ease to your life and gives you time to focus on more important things with your website. Don’t think too much on it, having something is better than having nothing at all. Even if it has just an about me and a shop button, give your supporters what they want. And if you still don’t see yourself getting one, at least get an email list … but that’s another conversation for another day.